The item 101 amazing facts about Spain, Jack Goldstein, (ebook) represents a specific, individual, material embodiment of a distinct intellectual or artistic creation found in Charlotte Mecklenburg Library. 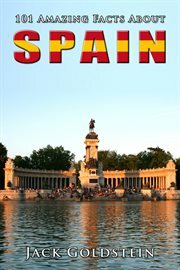 In this amazing eBook you can find more than one hundred facts about the country of Spain. Separated into sections such as its geography, its landmarks, famous Spanish figures from history and many more you will find some fascinating information inside! Whether you are planning on visiting Spain, working on a geography project or just want to know more about this beautiful country, this is an excellent addition to your bookshelf. Find the information you need, fast!